This high quality, exquisitely finished, Bottle Wine Rack Unit #3 stacking unit is brand new. The manufacturer is Authentic Models (please see below). The Bottle Rack Unit #3 is handmade of solid wood. Handcrafted construction with solid brass hardware, all corners are banded with solid brass. The Bottle Rack Unit #3 is finished in an antiqued lightly distressed honey French finish. The wine rack holds 12 bottles. On the bottom of the unit is a rugged nesting wooden rectangular section that sets into the top of the other available wine & glass stacking units, this nesting section also makes for a sturdy base if the unit is placed on the bottom of the wine & glass rack assemblage. 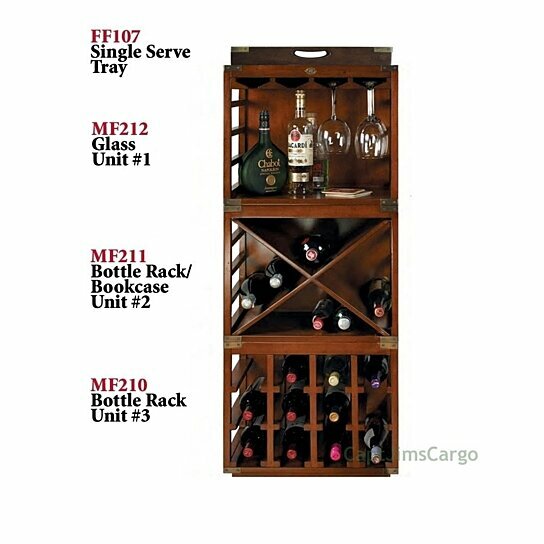 There are three unique wine & glass rack stacking units (MF212, MF211 not included) and a single serve tray (FF107 not included) that provide a compact assemblage. The units nest on both the top and bottom which makes for a sturdy construction. The single serve tray nests on the top of the assemblage and becomes an indispensable surface for pouring and for serving your fine wine & cocktails. The units can be mixed & matched as you desire and if the units are mindfully stacked you can go 4 units or more high. The other stacking units that are available are the MF212 Glass Unit #1, MF211 Bottle Rack/Bookcase Unit #2 and the FF107 Single Serve Tray. The Bottle Rack Unit #3 measures 16.5" height x 19.75" width x 12" deep. This Bottle Rack Unit #3 when stacked with all similar #3 units would make a beautiful compact bookcase or when mixed with the other available wine glass stacking units a unique compact home bar. Regardless of how you choose to build your stacking unit assembly it will certainly make a great addition to your nautical decor.